The Union Finance Ministry has increased the plan outlay of Chandigarh by 25 crore and pegged it at 1185.96 crore, up from Rs 1160 crore. Out of this increase, Rs 8 crore is for development (under plan head), while the rest is for meeting the expenses of running the government. At least 25 shops were gutted in a fire that broke out in the Sector 18 rehri market here this evening. Shops of clothes were reduced to ashes. A shopkeeper mourns as his shop was reduced to ashes in a fire in the Sector 18 rehri market in Chandigarh on Monday. A Division Bench of the Punjab and Haryana High Court headed by the Acting Chief Justice, Mr H.S. Bedi, today restrained the UT Administration from felling trees at Kishangarh village where the Chandigarh Technology Park is coming up. Unable to bear the death of his five-year-old grandson in an accident two months ago, 58-year-old Assistant Sub-Inspector Kali Ram today shot himself dead with his service revolver in the Police Lines, Sector 26, here today. A Kharar court today issued notice to the Punjab Cricket Association for March 2 regarding the issuing of complimentary passes for the March 8 India-Pakistan Test match at Mohali. Travellers from Northern Punjab, including Gurdaspur, Amritsar and Jalandhar, besides Jammu and Kashmir, will not have to pass through Chandigarh for reaching Shimla once the proposed road from Siswan to Baddi comes into being. ‘Tumhari Amrita’ starring Farooque Shaikh and Shabana Azmi had a record innings in the theatre world with unprecedented audience response, multiple showings and nearly two decades of housefuls across the world. What is the agenda for the next World Punjabi Congress? We will host the 12th World Punjabi Conference in Lahore from April 16. Around 400 delegates from 50 countries will take part in it. Many are the adjectives that have been used to describe the city, ranging from the appreciative to the offensive, as it has journeyed across half a century. The reason for this is that this modern city was made with a western plan. One post-modernist view of our good old Chandigarh is that it is too realistic and inflexible. Sites allotted for the setting up police posts and offices here over 15 years ago have turned into garbage dumping points even as the Police Department wastes funds on paying rent for accommodation to house its offices. While the Western Command will lay more emphasis on field exercises, it will also be testing the Army's revolutionary command and control systems later this year. The Punjab and Haryana High Court today issued notice of motion on a petition seeking quashing of the selections of Readers made by the Punjab and Haryana High Court sometime back. Of the two Air Vice Marshals who had challenged the selection board’s decision in the Delhi High Court to supersede them, one is being promoted. The Ministry of Defence has told the Supreme Court that AVM Harish Masand who retired on January 31, 2004, would be recalled and promoted to the rank of Air Marshal. Lieut-Gen Tej Pathak (right) and his son Lieutenant Varun in a ready position to take a para-jump. Chandigarh will at last have a daily train to South India. Union Railway Minister Laloo Prasad Yadav’s announcement of extending the Kerala Express, running between Trivandrum and New Delhi, to Chandigarh comes 10 years after the demand was first made during the tenure of late Prime Minister Narasimha Rao. Members of the Technical Services Union, Punjab State Electricity Board, today staged a dharna outside the office of the Superintending Engineer, Mohali circle. The employees were protesting against the contracting out the running of four micro hydel projects in the state run by private contractors. The Municipal Corporation will launch a month-long sanitation campaign in the city from tomorrow. Dubbed as the ‘maintenance campaign’, the project intends to cover the entire city. The area of operation includes the slums within the MC limits also. Mr Samual Banjamin, Senior Foreman, retired here today after putting in more than 38 years of service in The Tribune. He was given a warm farewell by his colleagues at a farewell party arranged in his honour at the office premises. Doordarshan, Chandigarh, will telecast the exclusive Chandigarh-made five episode documentary series on “Ek din mere saath”, every Tuesday at 6.30 pm. Strained relations with her in-laws forced Ms Nidhi (21), a third year student of Dental College, Kot Billa, to allegedly commit suicide. Nidhi’s body was found hanging in a room of her rented accommodation in Sector 12-A, this afternoon. Police sources said Nidhi’s mother Mrs Asha Arora, who had come from Panipat to see her daughter this morning, found the room of the house locked from inside. One person was injured when two cars collided at the Puncom chowk here today. 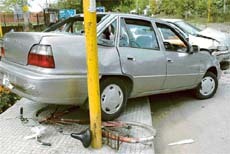 It is learnt that a person going on a bicycle got injured when one of the cars hit him. He was taken to a private hospital. A medical examination of five accused and a minor girl involved in an abduction case has confirmed that the girl was raped by them. Police sources said reports of a few other tests were yet to come. Ajay who tried to decamp with property from a house in Phase III B 1 here was beaten up and handed over to the police today. It is learnt that the suspect, Ajay, who hails from UP and lives in Sector 56, entered Mr Kamaljeet Singh’s house, where his wife worked as a domestic help. A 33-year-old unidentified migrant labourer reportedly committed suicide by hanging himself with the ceiling of a cowshed in Lalru village, late last night. Over 40 students of the school for blind in Sector 26, school for the deaf and dumb, Sector 18, and the home for the mentally challenged, Sector 32, spent a day at the Centre for the Development of Advanced Computing here. A two-day seminar on “Creative forms of the Punjabi culture” was organised by the Department of Correspondence Studies, Panjab University (PU), and Punjabi Academy, New Delhi, on the PU campus here today. Tsunami has served as a wake-up call for scientific institutions in the country who, under the new Science Plan, have decided to pool their resources for managing coastal hazards. Prof M.L. Munjal of the Indian Institute of Science, Bangalore, delivers a lecture on “Designing for quietness” to mark the National Science Day, at the CSIO, Sector 30, Chandigarh, on Monday. A four-day workshop on “Drug Discovery and Development in the New Millennium: Interface Within Silico, Cell-based and Pharmacological Experimentations” was inaugurated at the National Institute of Pharmaceutical Education and Research (NIPER) to mark the National Science Day, here today. The Science and Technology fortnight concluded at St Anne’s Convent School, Sector 32, here today. The fortnight started on February 10 and concluded today. 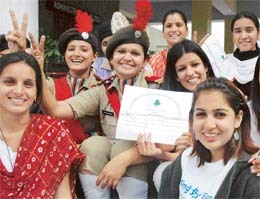 Government Model High School, Sector 29-A, celebrated National Science Day on Monday. The function was sponsored by the Department of Science and Technology. Mr G.S. Bains and Ms Amandeep Kaur presided over the function. The Central Board Secondary Examination for Class XII will begin with the physics paper tomorrow while the first exam for class X students is slated for March 3. Panjab University (PU) Syndicate at its meeting held today decided to continue with the course in Tibetan language for another session. The course was otherwise on the verge of discontinuation due to poor response for the past couple of years. 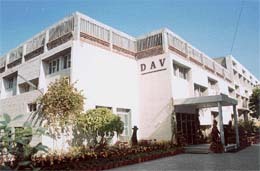 DAV Sr Sec School, Sec 8, Panchkula, was established in 1981 under the aegis of the DAV Managing Committee and is affiliated to the CBSE New Delhi. The motto of the school is “Education is not the filling of vessel but the kindling of flame”. Students are endowed with seeds of greatness and when they use what they have got they can do great things. They have to recognise, develop and use all that is within them and become the best. To be and get the best they have to start with a hope that they will succeed. The four accused in the firing incident at Kalka yesterday — Kalka Truck Union leader G.S. Garcha, Baljinder Singh, Satpal and Achin Walia — were remanded in judicial custody today. They were produced before the court of the Judicial Magistrate, Mr Ajay Aggarwal, who sent them to judicial custody. A Punjabi kavi sammelan marked the ‘NOSTALGIA-2005’ organised by the Old Students Association (OSA), of Government Degree College, Dera Bassi, here today. Known Punjabi poets Surjit Paatar, Sukhwinder Amrit, Tarlochan Lochi, Ravinder Bhattal, Bhushan Dhianpuri, Pradeep Bhullar and Manjit Indira regaled the audience with their poems. IT was indeed a divine experience for the elite city audience at the Tagore Theatre today as many of them saw the star singer Hans Raj Hans in a different ‘avtaar’ as with the strains of soulful Sufiana music sung in deep spiritual rapture in his mellifluous voice transcended to new horizons in a special musical soiree ‘Shaan-e-Sufi’. The event organised by the Spice Telecom in collaboration with the Chandigarh Sangeet Natak Akademi to bring alive the mysticism of Sufi saints in letter and in spirit. Government College for Girls, Sector 11, organised its 49th annual prize-distribution function today. Mr Dilip Kumar, IAS, DPI (C), Chandigarh Administration, was the chief guest. Around 248 prizes were distributed among students. Eighteen students were presented with roll of honour. Forty students were awarded college colours for their achievements in sports. A colourful Bharatnatyam classical recital by danseuse Suchitra Mitra graced the opening of the Classical Dance School at the strawberry Fields World School in Sector 26 yesterday evening. Gymnastics does not hinder growth. It is a common belief that those who take to gymnastics have to face less growth of height. But various researches and gymnastic experts dispel this myth. They say even hereditary factors may be responsible for the growth of a child who has taken to gymnastics. Gymnastics cannot be squarely blamed. In response to the appeal of the Punjab Cricket Association (PCA) asking residents of Mohali, Chandigarh and Panchkula to accommodate guests from Pakistan, as many as 47 written offers have been received so far at the PCA here. The Punjab Governor and UT Administrator, Gen S.F. Rodrigues (retd), said that we should continue with the process of exchange of sports and cultural events and have more mutual interaction between people of two Punjabs to strengthen the ties of friendship and create a climate of trust and goodwill. The Deputy Commissioner, Ms Neelam P. Kasni, today stripped Naib Tehsildar, Panchkula, Mr Jaiveer Malik of all powers to register sale deeds for one week. He had allegedly failed to follow the set of rules for the registration of sale deed of a flat in Bhainsa Tibba village, in the Mansa Devi Complex. Only 1534 commercial establishments in the city have availed of the self assessment scheme of the Municipal Corporation to pay property tax. Today was the last date of filing their returns.